[Guaranteed Accuracy Range]: ± 2% clockwise ± 3% CCW of indicated value, CW, from 20% to 100% of full scale. You have probably heard of torque before, but unless you work in the automotive industry or you fiddle with cars in your spare time, you may not have much experience with a torque wrench. This small device is an essential tool for a mechanic, as certain parts of a vehicle must be tightened to the torque levels recommended by the manufacturer, as failing to do so could cause issues, especially if the bolt is located in the brake system or in the suspension. It is important to know what you need from your torque wrench before you decide which model to purchase. This guide is here to help, and we have included a few options for you to consider that may be a quick solution to your needs. ACDelco is a company that has been manufacturing high quality car parts and tools to maintain your vehicle for over 100 years. Their focus is building a trusting relationship with customers by making top of the line tools that they can depend on. 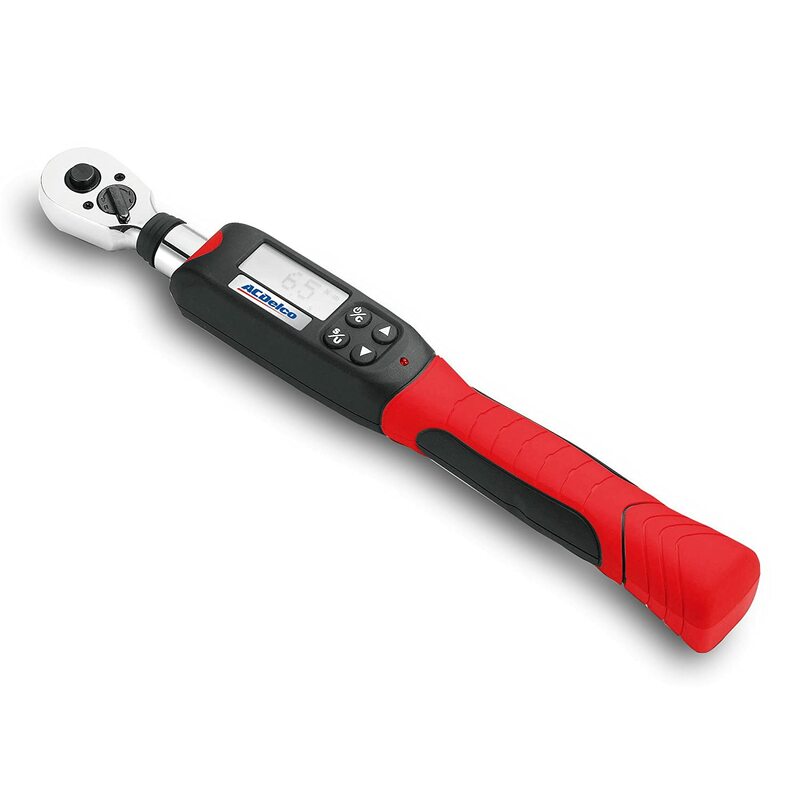 The ARM601 is a digital torque wrench that lives up to the standards of the company as well as those of the critics and customers who have used this tool. Since this is a hand tool, you will be happy to know that it is only 2.2 pounds, which means that it will not be too much additional weigh in your tool box. It is also 17 inches long, which will give you plenty of reach when you need it. This ½ inch square drive is able to accommodate a range from three foot-pounds to 99 foot-pounds, and it has an accuracy level that is only plus or minus two percent. Since this is a digital model, you can expect to hear a buzzing sound when you have reached the desired torque as well as a digital display on the LCD screen that is located on the handle of the unit. The display is capable of giving you a reading in kilogram-centimeters, Newton-meters, and inch-pounds, which means that you will never need to calculate or convert your digital readout. This unit does require four AAA batteries to function, but thankfully, the unit also features an automatic shut down functionality that keeps the device from draining the batteries. After one minute of inactivity, the unit will turn off automatically. This tool is designed to be highly adjustable for your individual needs, so it is designed with torques, measurements, and modes that you can customize to your requirements. Each of these options are extremely easy to set up, and should only take a few moments. The unit operates in both directions, counter clockwise and clockwise, so it will be easy to maneuver for anyone, whether they are dominant in their right or left hand. To ensure that your hands can maintain a firm grip, the handle is fitted with an anti-slip rubber grip. In addition, this unit comes with a one year warranty from the manufacturer. The reviews for this tool are impressive, as 17 out of the 19 reviews on Amazon have been rated with a positive review. The only negative reviews had to do with the battery requirement and the fact that no batteries are included in the box, which is not necessarily a negative review, as many professional users expect a digital torque wrench to require batteries. The majority of the reviews were left by customers who find it easy to make adjustment using this tool, especially since there is an audible notification to let you know you have reached the torque level you set the tool at. CDI Torque has been a leading manufacturer of torque products since their inception in 1968. Their torque screwdrivers and wrenches have all been calibrated to bring you the most accurate level of torque possible. They also strive to create products that are durable and long lasting, so it is no surprise that their 2502MRPH was selected as our silver pick on this list, as it is a great option for someone who is looking for a click type torque tool to tighten lug nuts and bolts on your vehicle. This unit is a little longer than our gold pick, coming in at almost 13 inches, but it is also a bit lighter to carry, weighting in at 1.2 pounds. This lightweight tool features a 3/8 inch drive that is capable of accommodating a large range of needs, 30 inch-pounds to a full 250 inch-pounds, which is a far larger range than our gold pick. It is also incredibly accurate; in fact, this tool has been calibrated in both directions. Clockwise, the unit has an accuracy level that is only plus or minus four percent, on the other hand, the counter clockwise level of accuracy is slightly less accurate, with a plus or minus of six percent. This may not be an issue for some, but make sure to take this accuracy difference into account before deciding on a purchase. Setting up this wrench is extremely simple; in fact, there is a spring loaded locking ring that can easily be pulled down to make sure that torque level is not accidentally changed. The handle of the device is designed with an ergonomic shape that also features a comfort grip to help you keep a tight hold on the tool when you are using it. This wrench includes a limited lifetime warranty from the manufacturer as well. Insofar as reviews for our silver pick, about 90 percent of the reviews that are currently posted on Amazon have been given a positive rating of at least four stars. Customers love the fact that this tool has a loud click to let you know that the preset torque level has been acquired. Our bronze pick is manufactured from a company that is dedicated to creating high quality hand tools at a low price point. 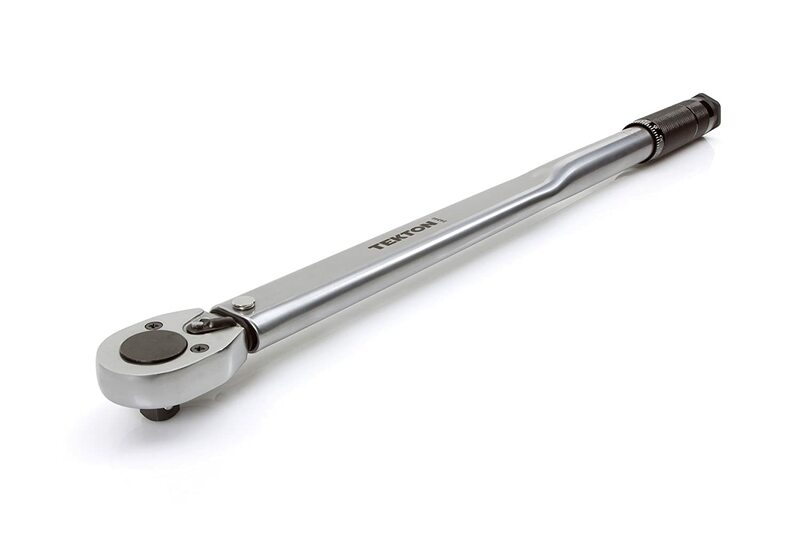 The Tekton 24340 is a click type wrench that is designed to be a durable solution for all of your torque needs. It is the longest wrench on our list, coming in at about 25 inches in length, but that allows you to have better access to get to all of those hard to reach places. In addition, it weighs about six pounds, so maneuvering this tool may be difficult for some. This ½ inch drive is designed to be extremely accurate, as it has a plus or minus four percent accuracy. In addition, this device is capable of accommodating a range that is between 25 inch-pounds and 250 inch-pounds. The construction of this tool is comprised completely of steel and is designed to be durable and long lasting. There is also a corrosion resistant coating on the tool that is meant to add further protection. Since the unit is a click style tool, there is no need for batteries. The tool can be used in both a clockwise direction as and counter clockwise one, which makes it easy and convenient for anyone to use, whether they are left or right handed. The scale uses high contrast markings to indicate the torque level, which makes it easy to read in any light. It also features a dual range that can be read in either Newton-meters or inch- pounds. In addition, the manufacturer has included a lifetime warranty with this product, as their motto is that their tools are always covered. When it comes to the reviews that are available concerning our bronze pick, many of them have positive ratings. In fact, out of the 359 reviews that are posted on Amazon, 94 percent of them were at least a four star quality level. Many of the individuals who left reviews on this product have agreed that the accuracy level is spot on and the clicking sound is easy to hear when you are working. Any issues that were encountered with the tool and mentioned on the forums have been address by a customer service representative, so it seems that they Tekton is dedicated to making their customers happy. If you don’t have a large budget to work with to purchase the torque tools that you need, you can consider our ballin’ on a budget option. This pick comes from the same manufacturers as our bronze pick, so you already know that it is a quality unit. It is smaller than our bronze option, but it is still a great size to fit your automatic repair needs, as the tool is 18.5 inches long. In addition, it only weighs 2.2 pounds, so you will be able to easily add this tool to your toolbox. 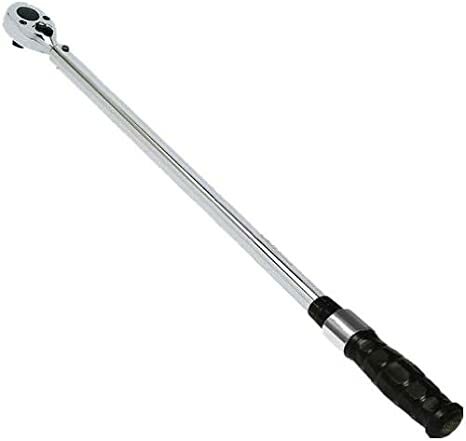 This click type torque wrench is designed with an all metal construction that will make it a durable for years. It has a convenient non-slip handle that will help you maintain your grip. The unit is a reversible tool that can be used in both directions. It is also an extremely accurate tool; in fact, it is calibrated at plus or minus four percent. The ½ inch drive is designed to accommodate a range from ten foot-pounds to 100 foot-pounds. In addition, the device features a dual range scale that has a high level of contrast that makes it easy to read. 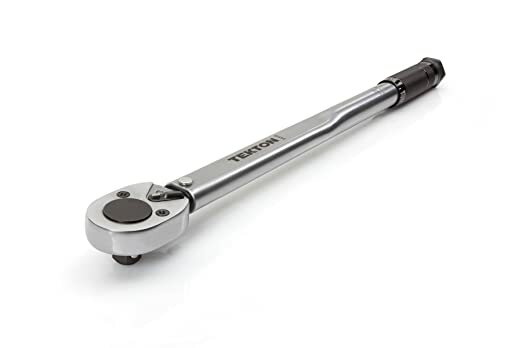 As with all Tekton tools, this wrench is covered with a lifetime warranty. Insofar as reviews, this tool has almost 1,000 testimonials available on Amazon and almost 90 percent of them have been rated with positive reviews. Many of the customers who reviewed this product agree that this tool is a great value that has an extremely accurate level of torque. It is the perfect solution for a driveway mechanic to use when tightening lug nuts is required, and if there are issues that you encounter with the device, there is excellent customer service available to assist you. • Click Type – This is the type that it typically preferred by mechanics, as it is simple to use. When the correct amount of torque is applied to the lug nut of the bolt that you are tightening, the device will notify you by making a clicking noise. It is important to tighten the bolt until you hear the click, but at that point you must stop, as too much torque is just as bad as not having enough. 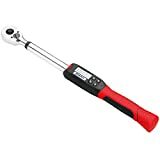 • Electronic or Digital – This type of wrench works basically in the same manner as the click type; however, the main difference is that instead of clicking, you will hear the device making an electronic beeping sound to let you know that the bolt is tight enough. The tool will also display the exact torque that was applied on a digital display, so you will have another visual means to let you know when to stop tightening the bolts. Some digital wrenches have additional bells and whistles, but if you don’t plan to use the extra features, then spending the extra money may not be worth it to you. • Beam – This type is the oldest type of torque wench that is still available for purchase. It is designed with a beam that flexes to a certain area on the gauge at the end of the unit as you tighten bolts. There are no bells and whistles on this device, which means they are more cost effective, so they may be a great choice for you. One caveat though, this tool may not be as accurate as the other types we have discussed, as it offers more of a manual reading than the others. • ¼ inch drive – This wrench is great for smaller nuts and bolts that lie in the range of four to 21 foot- pounds. • 3/8 inch drive – This size fits the majority of the nuts and bolts that will need to be tightened on cars and smaller trucks. A unit of this size will have a range of 15 to 75 foot-pounds, which makes it a great option for most individuals to select. • ½ inch drive – This size is designed for larger nuts and bolts, between 30 and 250 foot-pounds, like those typically found in a suspension system. In addition, sometimes you will see this size being utilized to secure the motor or the transmission of your vehicle. • ¾ inch drive – This size is not commonly used, but it can be useful for tightening the center lug nut in your vehicle’s wheels, which is something that only a mechanic of a true car enthusiast would need to worry about. When you purchase a torque wrench, it should come with a certificate of calibration to let you know when it was calibrated and the accuracy of the device. A good accuracy level to shoot for in this type of tool is above five percent. Ratcheting is also a feature that you may want to consider, as bi-directional ratcheting will make it easy for both right and left handed individuals to use the tool. If you are left handed and thinking of purchasing a beam type, then you may not be able to finds this feature, which could make it more difficult to use. Make sure that the tool you select is not riddled with plastic components that will make the device less durable. To produce a good amount of torque, you should look for a unit that has an all metal construction that is designed to last for years of use. The handle of the unit can have a grip, as this is actually a great feature to have to make sure that you can keep a good grip on the tool. Working with a vehicle can make your hands oily and slippery, so having a grip on your tool will help you tighten the nuts and bolts without additional slippery frustrations. Price is always a consideration when you are purchasing a new tool, and as always, make sure that your budget is large enough to acquire the features that you desire in your new wrench. Also, make sure to find a unit that has a warranty included with the purchase, as most manufacturers should include at least a one year warranty on this type of tool. Anyone in the automotive industry will tell you that a torque wrench is an important tool to have in your arsenal of tools. Hopefully this guide has helped you figure out what features you need your torque wrench to have; in fact, maybe you have even selected one of our top picks to purchase as your own. Regardless of which tool you select, make sure it is a durable device that will be able to tighten the nuts and bolts on your automobile for many years.